"Auricular acupuncture is probably the most developed and best documented, scientifically, of all the Microsystems of acupuncture and is the most practical and widely used." However until recently it was not known if Ear Acupuncture Points Treating Anxiety where effective on there own. To test this two researchers from the Yale University School of Medicine - Drs. Shu-Ming Wang and Zeev N. Kain - assembled a group of 55 patients for a blinded, randomized controlled trial to ascertain whether auricular acupuncture could in fact decrease acute anxiety. The population of the study consisted of a hospital operating room’s staff, a stressful job to say the least. This group was divided into three subsections of 22, 15 and 18 patients, respectively. The first group, that of 22 people received bilateral (meaning on both sides) auricular acupuncture at the Shen men point. This point, located on the upper half of the ear near the inferior lateral wall of the triangular fossa is often used as part of multiple point treatments and rather than having a particular property is thought to enhance the overall effect of acupuncture more. The second group, that of 15 people, received the same type of acupuncture at a "relaxation" point high on the ear, at the superior wall of the triangular fossa. This point is specifically used to treat anxiety and stress related conditions. The final group, that of 18 people, received sham (fake) acupuncture at a point on the middle ear that has no known effect. Each person was needled using small press needles, a tiny little needle that has a flat handle and is pressed into an acupuncture point and covered with a small plaster. Prior to this the anxiety levels of each patient were measured, and then retaken at intervals of 30 minutes, 24 hours and 48 hours after treatment. 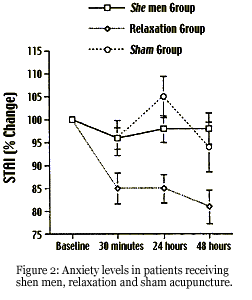 While Shen men had little effect on the anxiety levels over the 48 hours period, the sham acupuncture group actually became more anxious, peaking at the 24 hour mark. The relaxation point acupuncture group however had a marked and dramatic lowering of their anxiety levels within the first 30 minutes and continued to decrease in anxiety of the 48 hour period. The researchers were left in no doubt that Ear Acupuncture Points Treating Anxiety was most effective. If you suffer from anxiety or stress and simply need to relax, then perhaps you should consider Acupuncture and Traditional Chinese Medicine. I have been privileged enough to treat many patients for anxiety and am happy to say I have helped all of them relax, de-stress and enjoy a calmer quality of life. Finally if you have any questions or concerns regarding Ear Acupuncture Points Treating Anxiety or if you wish to start a course of treatment then please feel free to contact me or make an appointment where we can discus any specific concerns or questions you may have. 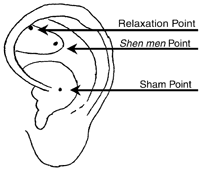 You have been Reading about Ear Acupuncture Points Treating Anxiety. It may interest you to read about Acupuncture for Anxiety Here.